Those of your customers who appreciate beauty will love this hansgrohe mixer range. The unobtrusiveness of Talis Classic makes it ideal for designing elegant bathrooms. Yet not only does it bring classic beauty to the bathroom, it also incorporates environmentally friendly technology: the EcoSmart water and energy-saving function is automatically integrated. Excellent ease of use with ergonomic handles and mixers of various heights transform your customer's wash basin into the ComfortZone. Minimalist beauty in all areas of the bathroom: the Talis Classic range includes mixers for bath tubs and showers – for exposed and concealed installation. For the wash basin, your customers can select single lever mixers in various heights – to create a customised ComfortZone. The range also includes a 3-hole basin mixer. 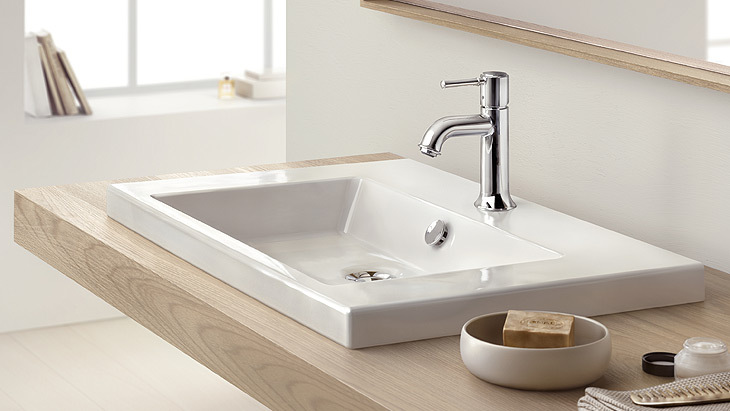 ComfortZone test: Which wash basin matches Talis Classic?